(Barry Chin / Globe Staff) James Posey rejected the Celtics' offer of 3 years starting at $5.5 million to sign with the Hornets. Forward James Posey agreed to a four-year, $25 million contract with the New Orleans Hornets yesterday, leaving the Celtics after helping them win their 17th NBA championship in his only season in Boston. Posey's agent, Mark Bartelstein, had said recently that a contending team could soon step up and make the offer needed to land his client. New Orleans was that team. An NBA source said Posey is expected to sign the contract by week's end and have an introductory press conference in New Orleans next week. "It's always tough," said Posey by telephone from Los Angeles, where he and his former teammates were taping the ESPY Awards. "It's a tough decision with the team and what we had accomplished as an organization and with the Celtic pride. We were able to win it all. For it to come down to this is never easy." The Celtics signed Posey last Aug. 28 to a one-year contract with a player option for a second season. The Cleveland native averaged 7.4 points and 4.4 rebounds in 24.6 minutes per game this past season and was a candidate for Sixth Man of the Year. Posey, who also won a title with Miami in 2006, was considered one of the Celtics' leaders and was a key player in their championship run. But, as expected, on June 30 the nine-year veteran opted out of his contract, which would have paid him $3.4 million next season. According to an NBA source, the Celtics were willing to give the 31-year-old their full midlevel exception over three years, starting at $5.5 million next season. Boston, however, wasn't comfortable adding a fourth year. Posey also received interest from Cleveland, Detroit, Washington, Toronto, and the Lakers. "We liked James and we wanted him back," said Celtics general manager Danny Ainge. "He got a good deal in New Orleans. We were unwilling to go four years. We have to manage the business and manage the future and the present. We offered James Posey the most over the next two years than any other team, but fourth-year security was very important to him. We didn't feel it was in our best interest as a franchise to do that. We wish him well. He was part of a championship team. We did what he could to bring him back." Posey and several other Celtics were at TD Banknorth Garden Monday night with Ainge and team owners for the premiere of the championship DVD. Posey acknowlegded being stressed over free agency, and said several times that it would be a business situation and added that the Celtics were his top option. Prior to attending the ESPY Awards, Posey acknowledged it might be tough to be around his former teammates on the day he committed to signing with the Hornets. "It's a continuing celebration of winning the past year," said Posey of attending the ESPYs. "I'm still excited about that. I don't know. It's easier said than done being around those guys." The Hornets had the second-best record in the Western Conference last season (56-26) and lost in the conference semifinals to the Spurs in seven games. New Orleans has two All-Stars in guard Chris Paul and forward David West, and 2007-08 Coach of the Year Byron Scott, who had phone conversations with Posey during free agency. Whether Posey starts or comes off the bench, he would likely play more in New Orleans than he did in Boston. From the start of free agency July 1, the Hornets were focused on Posey and forward Corey Maggette (who signed with Golden State). "They were already good with the things they accomplished last year," Posey said. "They have a nice leader in Chris Paul, as well as David West, Tyson Chandler, and Peja [Stojakovic]. They have guys who can shoot the ball and play basketball. The chances of winning a title are bright." While Posey was in Boston for only one season, he said it was a year he'll never forget. "I'll miss [the fans]," he said. "They supported me during the season. Thanks for supporting me, showing me the appreciation." So, what now for the Celtics? Available free agents include Michael Finley, Devean George, Matt Barnes, Bostjan Nachbar, Maurice Evans, C.J. Miles, and Bonzi Wells. But don't be surprised if the Celtics attempt to re-sign one of their own free agents, guard Tony Allen. Allen's agent, Mike Higgins, said yesterday he expects the Celtics to make his client an offer. "[Allen] never shut that door," Higgins said. "He wasn't going to come back just to come back . . . If they thought they were going to get Posey, [Allen] wasn't as important [to Boston]. "There is a lot of interest [in Allen] . . . But I think they will come back and I fully expect them to make him an offer." 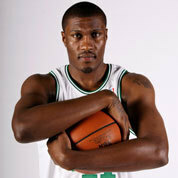 The Celtics also drafted swingmen J.R. Giddens and Bill Walker, both of whom are unsigned. Ainge said Posey would be replaced by committee and there wasn't a free agent in mind. "We go to the next options," said Ainge, who might consider adding another big man. "We're not going to sign one player that is going to replace James Posey. We're going to do it in a different way and different fashion. We are going to reallocate our dollars in different ways. "We are not necessarily looking for a small forward. We're looking to become a better team. We're still talking with veteran point guards. We're still talking to veteran bigs. We are still looking at wing players. We are still looking at all the above. We still have J.R. Giddens and Bill Walker's situation." Bartelstein, who also represents House, said there was nothing to report on the guard. When asked about Allen and House, Ainge said, "We have interest in bringing them back." The Celtics also are interested in point guard Tyronn Lue, but he is seeking more than the potential one-year deal the Celtics are discussing. 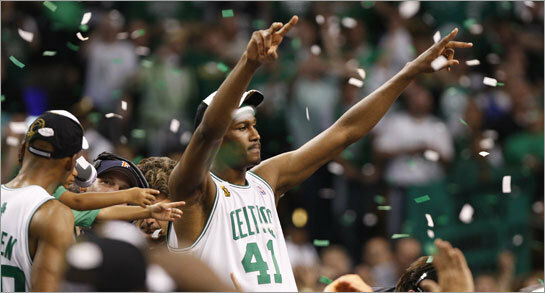 The Celtics also officially announced the signing of free agent center Patrick O'Bryant. The 7-foot, 250-pounder will be introduced to the local media today.